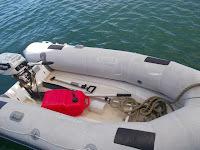 Galley Wench Tales: Spending for Safety: Dinghy Dramas... Done! Dino Bruschi, at Seagull Inflatables, is our new hero. 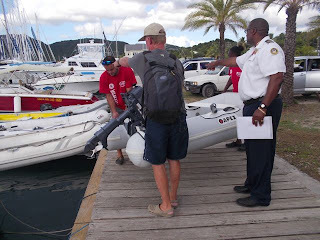 Seagull Inflatables in Falmouth Harbour, Antigua, sells a whole range of boating safety equipment (dinghies, life boats, life vests, inflatable fuel bladders, fire extinguishers, etc.). You can tell it’s not just a business; he really cares. “Did you lose motor case?” Dino asked. we shouldn’t sell it,” Dino pondered. where it won’t do anyone any good. 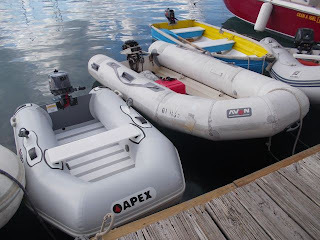 By the time he offered us his dinghy, Dino listened patiently over his lunch hour to our “We aren’t sure what to do about our dinghy.” We’d blathered on about davits and prospective future wind-vanes, and stowage and our current decrepit outboard motor and when to replace it…. Meanwhile Dino managed to keep several balls in the area, checking in quickly and professionally with several customers and staff, as well as pricing and spec options for us, without making anyone feel left out. We’re tiny, compared to the $14,000 superyacht customer he’s outfitting, we suspect they’re more his bread-and-butter, but we are sure we’re treated every bit as well. best left in his capable hands. 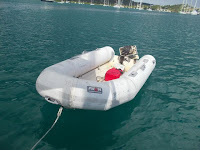 Dino gave us a ride over to it to assess our dinghy’s reparability. “Don’t buy a new one if yours is fixable. If it is, we’ll take care of it,” he promised. Watching the careful attention his staff was giving the dinghy they were repairing in their yard, we were confident in their work. At a second glance, when Dino returned with his loaner dinghy, moved our outboard onto his loaner, we determined our dinghy was not hypalon after all. PVC as compared to hypalon just doesn’t hold up well, and investing in continued repair rapidly becomes a losing proposition. 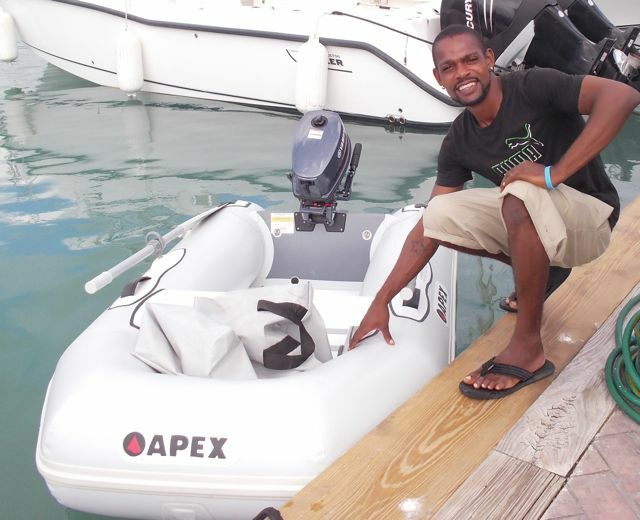 We decided then and there, delaying our dinghy purchase was futile. 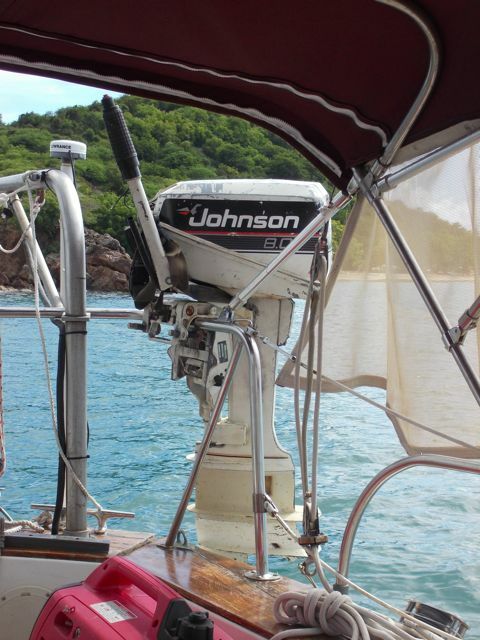 Then there was the question about when to replace out dinghy motor…. Our battered motor’s a 1996 (16-year-old) 8-horse Johnson; it’s disreputable appearance was not improved by the thrashing it got when sucked under the dock at Anse Mitan, Martinique. It’s capricious, often troublesome starting. It slogged and sputtered out erratically and without warning. This could happen even in the midst of a full plane. As a passenger, it necessitated a constant firm, taunt, grip on the painter and molding at least 3 touch-points of my body to the dinghy to avoid an unplanned, James-Bond like ejection. It’s not the swim I’d mind, but dunking whatever was in my ever-present daypack was more than more than I was willing to risk. To date, we’ve spent $600 for a used dinghy we thought was hypalon, $50 on glue. We also spent $110 to fix the Johnson outboard motor with a fix and tune-up, a relief we got off that easy given the unavailability of parts if needed for repair. Time-wise we visited at least 12 chandleries in multiple cities, multiple times in 5 countries and literally spent days hiking, rowing and internet researching solutions and alternatives. Not to mention all the time bailing, winching and repairing it. How many people does it take to transfer a dinghy? Too many! 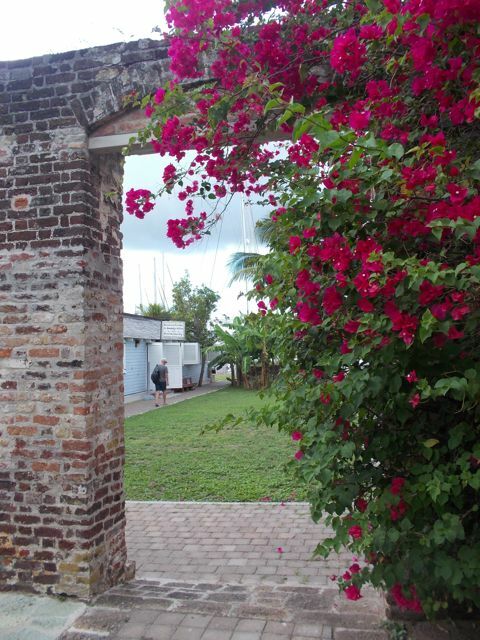 We’d heard and assumed our best deal for a motor and a dinghy would come when we’d be in St. Maarten (about a month out), Puerto Rico (further) or the U.S. (further still). The duty-free price Dino quoted us was as good or better a deal that we’d get there, particularly on the motor. At one point, we naively thought either of us could motor along in our dinghy, and my inability to do so was a friction point. However, it eventually became abundantly clear to my mechanic husband that at best someone with his skills and muscle-power would be needed to coddle, curse and bully it into behaving enough to get us where we needed to go. That meant any time I needed to go someplace, unless I swam or we hauled the 50-pound inflatable kayak out of our lazarette and blew it up, then Wayne needed to accompany or take me. While in general Wayne was a remarkably good sport about it, it was at best, periodically inconvenient. Return pickups without a working phone took some definite planning. Dino gave us 3 excellent new dinghy replacement options, 2 were roll-ups, and one was a hard bottom, all in the 8-foot range. His duty-free prices were all in line with what we’d pay in St. Maarten and his motor prices were particularly good. We opted for an Apex roll-up (not reliant our davits for stowage when passage-making) with an inflatable keel, much lighter than our current dinghy, made of more UV-ray resilient hypalon. With it, we purchased a 2-stroke 5-horse Yamaha motor, also considerably lighter, with a good reputation for reliability. The cost? ~$3,500 USD. It’s painful to spend over 1/10 of what we paid for our boat, which is our home (a killer deal at $30,000), on a dinghy and outboard. But between daily use and safety, it made sense, even if it’s more than twice our targeted monthly living budget for everything. Dino, ever ‘Mr. Safety,’ chided, “Since you didn’t get the $5,000 package [9’ hard bottom dinghy], you saved enough to a to buy lifeboat in the U.S. before you go to the Pacific.” That decision, and expense, fortunately, is a year away. We used Dino’s loaner while he guided us through the repeated multi-day customs hoops required for our purchase in Antigua for parts beyond. We thought it would take a day or two; it took a week. We’d just given up and blown town on Friday afternoon, when our dinghy paperwork arrived at customs. Monday we returned to Falmouth, confirmed our time at customs, 3 pm. 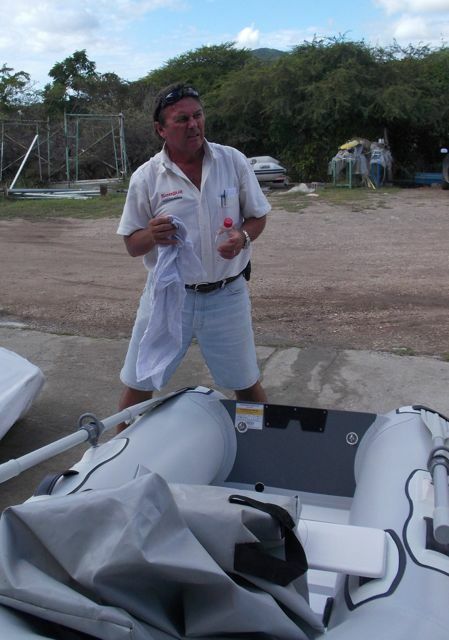 At customs, we met up with the customs official and two Outdoor World “owners” of the dinghy and motor. 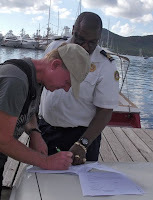 The five of us piled into a pickup, so the customs official could confirm our dinghy’s baptism, as the dinghy must touch the water before the paperwork could be signed. But wait, we weren’t done yet! The dinghy was missing the rings we needed to attach it to our davits, so we keep it raised above water for passages. The Outdoor World guys had another job, so Clyde from Seagull Inflatables brought us and our new dinghy back Seagull Inflatables. We discussed davits. Dino brought us back to his borrowed dinghy and our sad motor. One more day…. We got it, at long last, today. 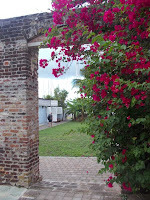 “It’s a little slow, isn’t it?” Wayne commented, as we motored, slowly, back to Journey. Yeah. But it’s dry. Our old dinghy, not quite yet filled to its usual calf-deep water. One tradeoff we hadn’t considered in replacing our current rig…. “How will you cool your feet down when you’re done with those long, hot hikes of yours?” teased Lili and Tomaz. Somehow, we’ll manage.